Experienced medics had no concerns over the planning of a fatal SAS selection exercise, a court martial has heard. Two men responsible for running the exercise in the Brecon Beacons are accused of negligent performance of duty. 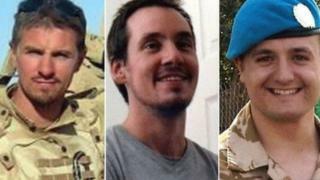 L/Cpl Edward Maher, 31, L/Cpl Craig Roberts, 24, and Cpl James Dunsby, 31, died after a 16-mile (26km) trek in July 2013. The serving officer and former warrant officer deny negligence. The three reservists were on a march over difficult terrain that had to be completed in under 8 hours and 45 minutes while carrying up to 27kg (4st) on their backs. A number of other soldiers fell ill on the same march, which took place on one of the hottest days of the year. The court martial in Bulford, Wiltshire, heard the two officers, known only as 1A and 1B, were in charge of risk assessments and directing staff on the ground. A medic on duty that day, known as '1H', was asked if he was concerned at any time. "Everybody knew it was going to be hot, but that was all," he replied. 1H said he couldn't recall if either officer "had sight" of the medical plan for that day, but he had prepared one and it was available to them in the command vehicle. He also agreed the response of the emergency services had been 'carefully considered' as part of 1B's plan for the exercise, including considering areas in which candidates may withdraw. Another medic, known as 1N told the court he was "confident" in the abilities of 1B after he'd overseen the extraction of a casualty in a previous exercise and his briefings were known to be 'comprehensive'. The court was told about a Wet Bulb Globe Temperature (WBGT), which measures how climatic conditions such as humidity can affect exercises, in accordance to MoD guidelines known as JSP539. "WBGT is normally taken on the day, we use it to either stop training or reduce training, or at east discuss it. It's an early warning system," 1H told the court. The court previously heard that 1A and 1B did not have the authority to change the route of the exercise that day, but could have stopped it if they felt it was becoming too risky. Mathew Sherratt QC, defending, suggested that while medics briefed each other on WBGT readings for the exercise via a WhatsApp group on their mobile phones, the information was not passed on to 1A or 1B. "It was mostly because the lead regular unit were conducting it near us, so if there were any problems the medic there would have told us." 1H responded.